The American Jewish Congress’ (AJC) vice president panned Hillary Clinton’s speech to his organization on Thursday, saying she gave a distorted and incomplete picture of her State Department record and failed to address criticism of the Obama administration’s policies on Israel and Iran. 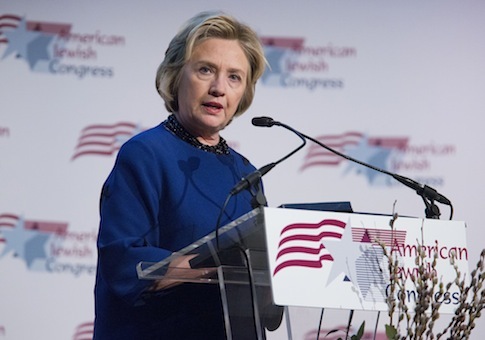 Clinton received a warm reception on Wednesday evening at the AJC, a Jewish organization run by long-time Clinton supporter Jack Rosen, when she was honored with the group’s lifetime achievement award. However, the decision to honor Clinton also sparked divisions among the group’s leadership. AJC vice president Herb London told the Washington Free Beacon that Clinton was a "dissimulator" whose remarks were full of "fabrications." "As Mark Twain said, ‘There are lies, damn lies, and statistics.’ I would add in Hillary Clinton’s comments," said London, who is also chairman of the AJC national governing council and a senior fellow at the conservative Manhattan Institute. Clinton struck a hawkish tone during her speech, emphasizing her role in persuading other countries to sign on to international sanctions against Iran, which she said brought the Iranian government to the negotiating table. But London said the speech ignored critical gaps in the Obama administration's sanctions policy. "She does not mention the fact that 22 nations were given special dispensation so they did not have to abide by sanctions," London said. "And while there was unquestionably pressure put on Iran, there were a lot of illegal dealings and a lot of nations that were violating the sanctions regimen. She didn’t mention that at all." London also questioned Clinton’s vow that the United States would "never waver in our support for Israel." "This is exactly what [the AJC audience] wanted to hear," London said. "I wanted to raise my hand and say, well then why did you put together a charm campaign for the Muslim Brotherhood, the same Muslim Brotherhood that when Morsi was in power in Egypt wanted to abrogate the peace treaty with Israel?" He added that Clinton failed to address several fundamental topics, including the anti-Israel Boycott, Divestment, and Sanctions (BDS) movement and whether she would authorize military action against Iran. "Hillary Clinton said all options are on the table [regarding Iran]," he said. "I’m so tired of this trite phrase. What does that mean? Are you willing to exercise the military option? When? Where? Under what circumstance?" While London said he sent Clinton bullet points on the BDS campaign before her speech, "she did not say one word about BDS" at the event. AJC’s president Jack Rosen and a Clinton spokesperson did not respond to requests for comment. Outside of London’s criticism, Clinton’s speech was well received by the AJC audience, which included dinner committee member Munr Kazmir, a businessman currently entangled in a federal lawsuit. Kazmir is at the center of a controversy involving the pro-Obama advocacy group Organizing for Action, which reportedly set up a meeting between Kazmir and a White House official one day before he pledged to raise $100,000 for the group. Russian oligarch Leonard Blavatnik served as the dinner’s honorary chairman. Clinton received the 2014 Stephen S. Wise Award for Lifetime Achievement at the dinner, a prestigious award whose past recipients include David Ben Gurion, Golda Meir, and Harry Truman. This entry was posted in National Security and tagged 2016 Election, Hillary Clinton, Iran, Muslim Brotherhood, State Department. Bookmark the permalink.